ACUROCLEAN SP90 is a powerful powder descalant based on sulphamic acid that is capable of dissolving the most stubborn industrial scale deposits without affecting the metal. ACUROCLEAN SP90 contains unique inhibiting chemical constituents that prevent the acid’s attack on the metal surface, ensuring minimum metal loss. 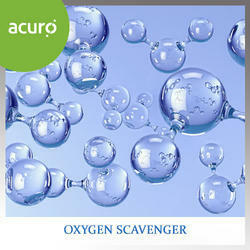 ACUROCLEAN SP90 cleaning method ensures that there is minimum plant dismantling. Thus the cleaning process becomes non-disruptive and turnaround time is fast. 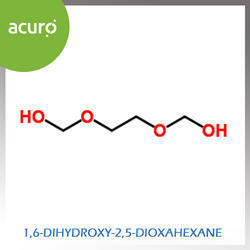 It is used in chilling plants, evaporator ,PHE plant, dehumidifiers, crystallisers, biolers etc. 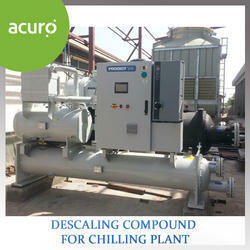 ACURO's descaling chemical for chilling plant is a powerful liquid preparation that is capable of dissolving the most stubborn industrial scale deposits without affecting the metal. It contains unique inhibiting chemical constituents that prevent the acid’s attack on the metal surface, ensuring minimum metal loss. Its cleaning method ensures that there is minimum plant dismantling. Thus the cleaning process becomes non-disruptive and turnaround time is fast. 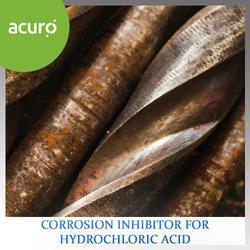 ACURO's corrosion inhibitor for Glycol is a specially formulated chemical additives designed to prevent corrosion in multi-ways. It treats the surfaces of the metal making them less susceptible to corrosion. It buffers the organic acids formed as a result of glycol oxidation. Inhibited glycol based heat transfer fluids provides corrosion protection without reducing system’s heat transfer efficiency. Glycol oxidizes when exposed to air and heat. When this occurs, organic acids are formed. If not properly inhibited, this fluid is very corrosive. 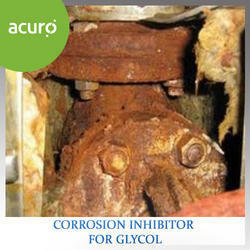 Glycol Corrosion Inhibitor is added to Glycol to act as buffers, preventing low pH attack on the system metals. It also passivates the metal surfaces protecting them from corrosion. Polishing of metal with passivating agents or chemicals is a very important step of complete metal treatment and cleaning. Polishing is a process by which a stable protective film is formed which fully conductive and inhibits further dissolution of metal. 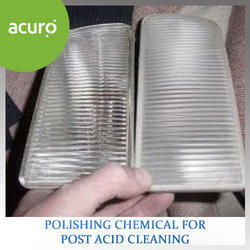 Polishing also eliminates chances of flash rusting after acidic cleaning of metal. Chemically cleaned or water jacketed boiler and heat exchangers should always be polished to avoid excessive fouling by iron oxides during service. When untreated hard water is used, it soon becomes necessary to remove scale build up. 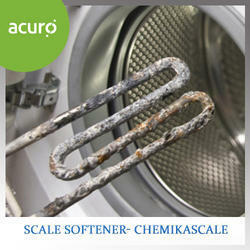 One method to remove scale involves the use of CHEMIKA-SCALE. CHEMIKA-SCALE is specially designed Polyelectrolyte to disintegrate adherent evaporator scale. It is a blend of rapid wetting agents and powerful dispersing agents. 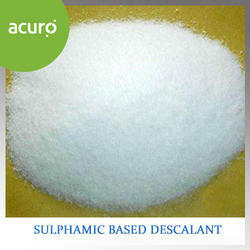 It is also compounded with suitable solvent to loosen and dissolve silica and cellulosic matters. When boiled for 8 hours in proposed ratio along with conventional Soda boiling Chemicals, results in peptised scales which can b removed by using single round of brushes or cutter. No stress caused during cleaning operation by rising surface tension of adherent scale. 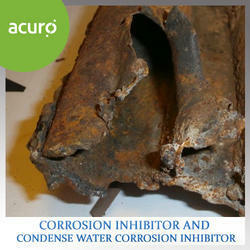 An appropriate Corrosion Inhibitor with yellow metal protection, oxygen scavenger, added with antiscalant. A suitable chlorine free Biocide for preserving water. 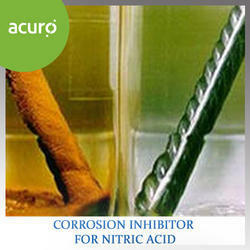 Corrosion Inhibitors prevents the metal components of any system from corrosion. Corrosion is caused by various impurities like dissolved and suspended solids, dissolved gases, biological impurities, and acids present in the water. Oxygen Scavenger prevents the corrosion induced due to oxygen. It chemically removes the last traces of oxygen from water.The oxygen scavengers from our assortment comes used as a factor of excellent industrial utility that comes found in many parameters and industrial backgrounds. Our oxygen scavengers come for finding an excellent utility in various procedures. Oxygen scavenger in liquid form. Removes last traces of dissolved oxygen from boiler feed water. 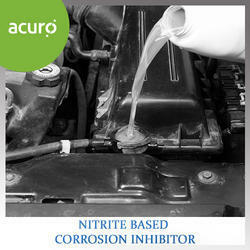 2 An appropriate Corrosion Inhibitor with yellow metal protection, oxygen scavenger, added with antiscalant. 3 A suitable chlorine free Biocide for preserving water. 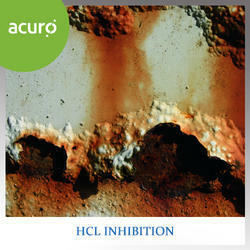 Looking for Acid Inhibitors ?